Lewis Carroll took a trip to Russia in 1867 – and he threw himself into this adventure as impetuously as Alice going down the rabbit hole. What did the great writer see in the “city of surprises”? The only time Lewis Carroll traveled outside the British Isles was when he took a trip to Russia – and he threw himself into this adventure as impetuously as Alice going down the rabbit hole. The role of the White Rabbit was played by Carroll’s friend and colleague Henry Liddon: On July 4, 1867 Liddon suggested to Carroll that they visit Russia, and, within just a week later, they had already set off. Researchers believe that this is where Carroll got the idea of “Through the Looking-Glass.” Even if he did not, one thing is absolutely clear – Russia made a big impression on the writer. First it was St. Petersburg, the “city of giants” with its wide streets (“even the secondary streets are wider than any in London”), then Moscow, where he spent two weeks, and Nizhny Novgorod, where he and Liddon dashed to the fair, naively hoping to get there and back in a day. Carroll spent his time in Russia with the palpable enthusiasm of someone making a new discovery, excitedly transcribing long words such as “zashchishchaiushchikhsya” into his notebook, haggling enthusiastically with cab drivers and finding comparisons for Orthodox churches. The English writer busied himself with meeting Orthodox clergy, sampling the black bread eaten by the monks (“undoubtedly edible, but not appetising”), rattling over potholes, trying cabbage soup and rowanberry liqueur, buying icons and toys and going to the theatre – not daunted by the fact that the productions were in Russian. Armed with a spyglass, he climbed up bell towers, did a good deal of walking and, fortunately, kept a diary. Not all of the sights that impressed him survived the historic cataclysms that followed over the next century and a half, and some underwent a truly Carrollian metamorphosis – especially in Moscow, the “city of surprises” in which one can go for a walk in his footsteps. Carroll and Liddon stayed in one of the most expensive hotels in pre-revolutionary Moscow – the Dussault, which was famous for its restaurant and guests, who included Leo Tolstoy, Fyodor Dostoyevsky and Pyotr Tchaikovsky. Writers were equally keen to place their characters here: In “Anna Karenina,” for example, Tolstoy sent Levin, Karenin and Vronsky to stay at the Dussault. The house itself was rebuilt and the hotel it housed was not preserved, but a hostel has recently appeared at this address (3, Teatralny Proyezd). An even stranger fate awaited the “Moscow inn” where the two friends went to find out about Russian cuisine. 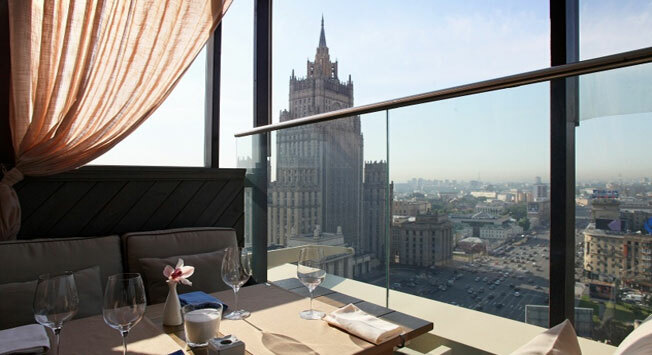 This is now the site of the Hotel Moscow, where guests can also try some fine and tasty dishes – except the cuisine is now Mexican, not Russian. Nowadays, instead of bell towers, the vertical aspects of the landscape come from high-rise buildings from Stalin’s time. In the foreground the Luzhniki sports complex – a legacy of the 1980 Olympics – lies in the bend of the river. It is still a popular viewing place for tourists, newlyweds and bikers. To add an element of the absurd to the view, though, you can ride on the cable car that links the viewing place with the embankment. A century later, the Novodevichy cemetery became one of the most honored in Moscow, as the burial place of artists and writers – including Anton Chekhov, Nikolai Gogol and Mikhail Bulgakov – and politicians, including Nikita Khrushchev. The beautiful convent itself was built in the 16 th -17 th centuries, and, in Carroll’s day, it was considered one of the richest in the city. From the moment it was opened, quite a number of distinguished women went to live in it – of course, not all of their own will. After the revolution, its belfry housed a workshop for the artist Vladimir Tatlin, and the convent itself was turned into a museum. Nowadays, a convent is again functioning here, and, within its walls, it only takes a little effort to imagine that one is back in the 19 th century. With his characteristic thoroughness, Carroll also studied the Kremlin: He climbed the Ivan the Great Bell Tower and examined numerous exhibits in the Armory (“thrones, crowns and valuables until they made my eyes ache, like blackberries”) and the palace (“a palace in comparison with which all other palaces must seem small and ordinary”). Of course, the pious Carroll was interested in St. Andrew’s Church . The only Anglican church in Moscow is situated in Voznesensky Lane. The austere, red-brick building that you can see today is a modern replica that had not yet been built in Carroll’s day. Carroll also visited Orthodox services in Moscow monasteries several times. The Vysokopetrovsky monastery in the very center of the city, on Petrovka Street, is still open – although it is no longer necessary to get up at 5 a.m., as Carroll had to. The morning services now start at 9 a.m. here, and you can visit after midday. If you are lucky you can also visit the refectory. This point on Petrovka Street is one of the places where Carroll’s historic Moscow merges with the modern city. Directly opposite the monastery, the Museum of Modern Art includes the March café, its name making a light and unobtrusive allusion to the tea-drinking of Carroll’s heroes. Other places forming part of the Carroll “legacy” that are worthy of attention are the panoramic White Rabbit restaurant (3, Smolensk Square) and the monument to the White Rabbit (54, Shcherbakovskaya Street). After that, things become surreal: Even the writer himself would be surprised to learn that, in Moscow, the names of his characters and works can be found not only on restaurants, night clubs, design studios, and training and development centers, but also on beauty salons and even pay-by-the-hour hotels.